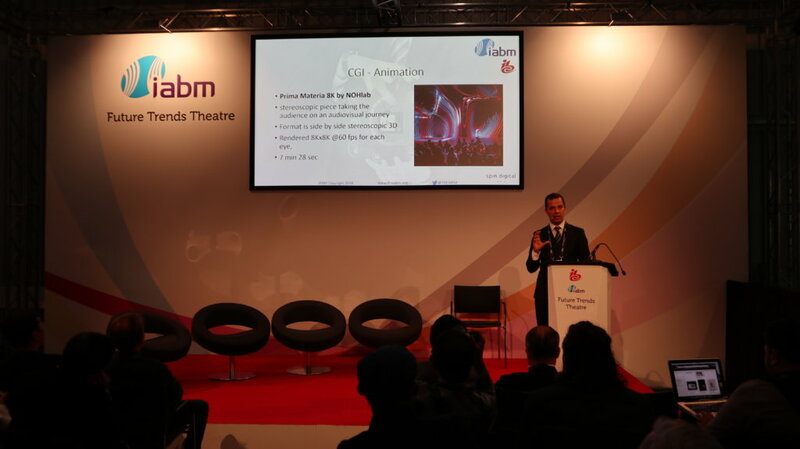 Mauricio Alvarez-Mesa, CEO of Spin Digital, made an invited talk at the IABM Future Trends Theatre during the past IBC 2018 in Amsterdam. The title of the talk was “Video technologies for the next-generation of immersive media”. In this talk Mauricio highlighted some recent developments in video technologies for immersive media including point cloud video and ultra high-res video technologies (8K and 16K). Spin Digital’s CEO presented to the audience the first results of Immersify, and European consortium working on tools and content for next generation immersive media. One of the main challenges with the immersive media applications is how to compress and decompress the huge files resulting from the new content creation techniques, while at the same time keeping a very high quality. Spin Digital has been working on the development and optimization of a software solution to handle this problem: a high performance and high quality video encoder and a media player for highly immersive media able to process video up to 16K resolution and at very high quality. IBC visitors were able to experience the visual quality of the new immersive media at a demo at the Intel booth. Using the latest version of Spin Digital’s HEVC Media Player, new content in 8K and 16K was presented on a 70 inches 8K TV screen. Ultra high quality 8K point cloud video from PSNC. This activity has received funding from the European Union’s Horizon 2020 research and innovation programme under grant agreement No 7620799 (www.immersify.eu).